- Your company is in a massive growth and want to promote entrepreneurial thinking? - You want to integrate a purchased company and consider whether the growing organizational structures are still suitable for this? - You have significantly expanded your product portfolio and want to reflect this development in your structures? - You want to integrate the foreign branches in the corporate structures sufficiently? 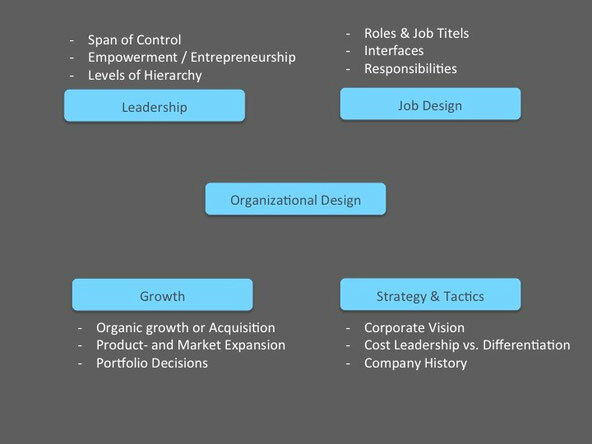 I can advise you in developing your organization design with determining the dimensions, hierarchy levels, types of organization, group sizes, roles, job title, responsibilities and interfaces. A reorganization is a special project with many challenges and pitfalls. The project has to consider different interests and project architecture should involve stakeholders at the appropriate level. A good post-merger integration begins before the acquisition of the company. In addition to the conventional analysis in the due diligence and the "organizational fit" should be considered. You want professional assistance for your reorganization and post-merger integration. I gladly support you as project manager or consultant.